Dude. 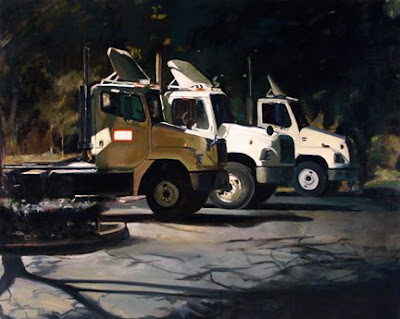 Didn't know a painting of trucks in the jungle could look so fresh. Nice. Your work never ceases to amaze me. I wish I could come and see it in person, but perhaps soon. Portland!!! Oh Portland, how I long to ride my bike through your streets! Jeremy how goes things? I beet you to it. I'm going to Portland at the end of this month! Awesome Darren I was just thinking about asking you if you are going any time soon. Tell me all about it when you get back. Meesimo you rock man!